Ever since internet use became a notable part of political media in the late 1990s, there have been intense debates about the impact of the internet on politics. For the first time in our post-election surveys, we asked some questions to test public attitudes about the role of the internet in American political culture. The answers showed how conflicted people are about the internet: Many expressed positive views about the effect of digital technology on their personal engagement with politics, but also noted concerns about the ways in which the internet might be influencing the broader culture and tone of politics. When asked whether the internet has made it easier to connect with others who share their own political views, 54% of online Americans agree that it has—44% say that the internet has made this a lot easier, and an additional 10% say that it has made it a little easier. Two in five (42%) feel that the internet has not had much impact in this regard. Demographically, Latino internet users are particularly likely to say that the internet has helped them connect with others who share their views—56% of Latino internet users say that the internet has made it “a lot easier” to do this, compared with 41% of white internet users. Those under the age of 50 are also relatively likely to view the internet as having a positive impact in this regard. Roughly half of online 18-29 year olds (54%) and 30-49 year olds (48%) say that the internet has made it a lot easier to connect with others, compared with 36% of 50-64 year olds and 23% of internet users ages 65 and up. The one in five online adults who used social networking sites during the 2010 campaign for political purposes are especially likely to say that the internet helps them connect with others who share their views—fully 64% of these users say that the internet has made this a lot easier, compared with 21% of these users who say that the internet has had no impact in this regard. Even as a majority of Americans feel that the internet has generally helped them connect with others, a similar number also believe that the internet has increased the influence of extreme views in the political debate. Just over half (55%) of internet users agree with the statement that “the internet increases the influence of those with extreme political views,” while 30% said they agree with the statement that “the internet reduces the influence of those with extreme views by giving ordinary citizens a chance to be heard.” One in ten online adults (12%) are not sure which of these statements best describes their own views. Interestingly, there are relatively few differences on this question based on demographic characteristics or one’s level of online political engagement. Those who feel that the internet has made it easier to meet up with others who share their views, are no less likely than those who downplay the internet’s role in connecting with others to see the internet encouraging extremism. Additionally, the 21% of online adults who are active politically on social networking sites are just as likely as other internet users to say that the internet increases the influences of extreme political views. Politically, Democrats and those who disagree with the Tea Party movement are a bit more likely to agree with the statement that the internet increases the influence of those with extreme views compared with Republican voters and Tea Party supporters. Six in ten online adults (61%) feel that the internet exposes people to a wider range of political views than they can get in the traditional news media, while one-third (32%) feel that the political information available online is the same as the information available elsewhere. As with the impact of the internet on meeting new people, adults under the age of 50 are significantly more likely than older internet users to say that the internet exposes people to a wider range of political views than they can get elsewhere—among internet users 67% of 18-29 year olds and 68% of 30-49 year olds say this, compared with 55% of those ages 50-64 and 38% of those 65 and older. College graduates (71% of whom say that the internet exposes people to a wider range of political views) also tend to have relatively strong views on this subject. Those online adults who utilize the internet for political information and engagement are significantly more likely than other internet users to feel that they are being exposed to a wider range of material thanks to the internet. This is especially true for the one in five online adults who use social networking sites for political purposes—fully 74% of these “political social networkers” feel that the internet exposes people to a wider range of political views than they can find elsewhere. Americans are similarly split in their assessments of the difficulty of separating truth from falsehoods when it comes to online political information. One-third of online adults (33%) say that it is usually easy for them to tell what it true from what is false when it comes to the political information they find online, while 56% say that it is usually difficult for them to determine this. There are few demographic differences when it comes to assessing the veracity of online political information, although young adults (ages 18-29) are slightly more likely than those ages 65 and older to say that it is usually easy for them to tell what it true online from what is false. The group we refer to as “online political users” is twice as likely as internet users who do not engage in political activities online to say that it’s usually easy to tell true from false political information (39% vs. 20%). Still, it is notable that even among this relatively tech-savvy group, more than half (55%) indicate that they have trouble telling true from false political information online. One in five online political users (22%) say that the news and information they found online in 2010 encouraged them to vote in the 2010 elections, compared with just 4% who said that this online content actually discouraged them to vote (73% said it had no impact one way or the other). These figures are nearly identical to the findings we got the last time we asked this question, in 2004 (at that point 23% of online political users said that they were encouraged to vote by the material they found online). A slightly larger number of respondents said that the political information they saw or read online made them decide to vote for or against a particular candidate—35% of internet users who voted in 2010 said this. There are relatively few demographic differences on this question, although voters with strong views towards the Tea Party movement were particularly likely to say that online information helped them decide who to vote for. 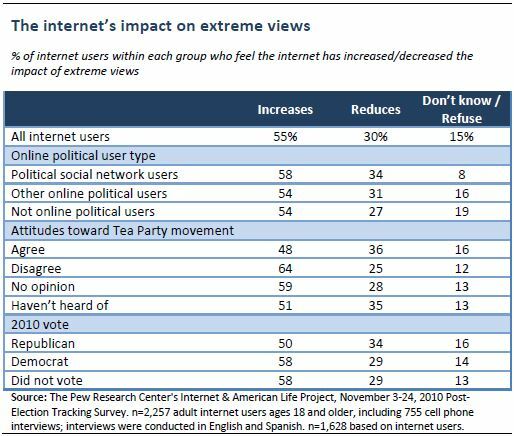 Fully 39% of internet-using voters who support the Tea Party movement and 38% of such voters who disagree with the movement said this, compared with 30% of those with no opinion of the movement one way or another, and 20% of voters who had not heard of the group.